« Day 327 in Beijing: Seat Belts and Wi-Fi. Day 328 in Beijing: Another Cab Story. 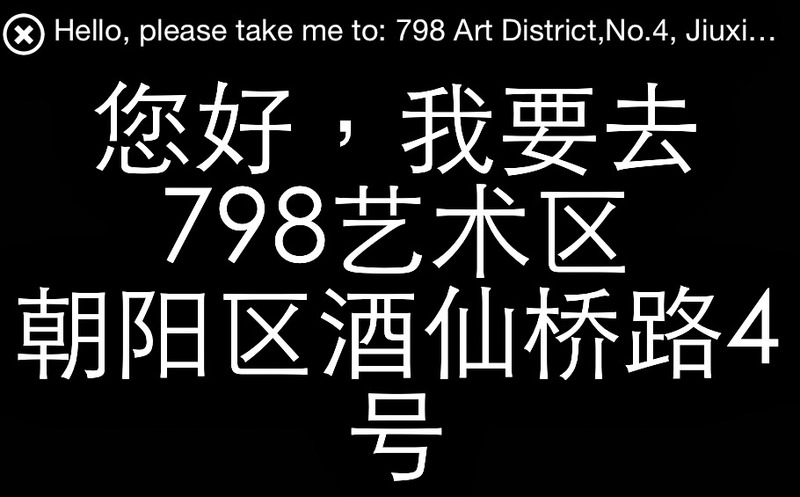 A taxi card to go to the 798 art district in Beijing. As I left work, I hurried out to the main road by my office and hailed a taxi. This involves a bit more work, here in Beijing, than it does elsewhere. Instead of just waving my hand, I wave my iPhone, with my “taxi card” already pulled up. This allows the cabbie to see me more easily, as it has a backlight on the screen, and also allows them to know where I am going once I get in. Taxi cards are cards that have directions on them in Chinese script. These are invaluable in Beijing because this city is constantly being built, and rebuilt, and nothing is constant except change. 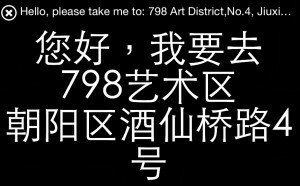 So, since my Mandarin in horrible, and addresses are quite hard (there are some streets that are a 22 letter word here), I use the taxi card. The taxi card has the whole address printed out on a virtual card on the iPhone screen. It is simple, it is quick, and the cabbies almost always know exactly where to go. Once in a while they don’t, so they tell me to take another taxi, but I think that might also be because taxi drivers get paid so little here that going a long distance doesn’t really add up when they can do a bunch of small taxi rides in their own area of town and not drive way out in the boonies where I’m living now. Again, this all changes in one month when I move to the center of town, and one block from my work, and to freedom. I honestly can not wait to move there and just walk across the street to work and to come home. It will reduce my commute by about 1 hour each day and my rent will drop. I will also be closer to the people that matter to me in Beijing and my life will be pretty much as perfect as I could imagine. And, for that matter, it is almost perfect now so that is saying a lot. So, I jumped in the cab and showed the driver my taxi card. He nodded yes and started driving. And then started talking on his cell phone. This is not unusual here in Beijing. I’ve seen a driver with 3 cell phones, as well as iPad, strapped to the windshield or dashboard, and still drive the cab while talking on one of the phones. It is amazing and unsafe. And classically China in every way. So, I start laughing immediately because the driver is this tiny little guy, no more than about 5 feet, 5 inches, and incredibly thin. He sounds EXACTLY like Jabba the Hutt. He could do a perfect impersonation if he wanted to! He had that amazing deep and gravely voice. I could have sworn he actually said, “Solo! Hay lapa no ya, Solo” and then laughed that HUGE Jabba the Hutt laugh afterward. The cabbie continues to talk on his phone and misses my turn off for the 4th ring road. Then he says, in English, “Sorry” since he was talking on the phone and made the mistake. I’m seriously dying from laughter in the backseat. This cab driver speaks English and has an awesome send of humor! Then, add to it that he turns off the meter, about 3 blocks from my house, and I want to hire this guy to drive me everywhere. He realized that his mistake caused my trip to be more expensive but he shut it down at the price it would have been. I actually didn’t mind paying more because this trip made me laugh so much but I couldn’t argue, since I don’t speak Mandarin, and so I just said, “Xie Xie” and smiled and laughed a lot with him.